Promoting recovery has become the rallying point for the consumer and family movement (1999 Mental Health Report from the Surgeon General). Throughout 1999 the public debate about mental health issues raised expectations about the recovery model as mentioned by providers, clients, advocates and citizens. The county’s present mental health system operates primarily as a safety net for its clients. While that is an improvement over the system that existed thirty years ago, the safety net all too often tends to keep clients in a state of dependency with minimal expectations that the clients will get well. As the mental health system implements the integration of the inpatient and outpatient system in 2001, recovery is expected to be a key theme in individual treatment planning. Successful caregivers recognize that a client will get well more easily or lead a more productive life when there is a high expectation that as a result of treatment, the quality of life of the client will improve. Specifically, the division should contract with caregivers to develop an atmosphere of treatment in which the interaction between the caregiver and the client focuses on the importance of a progression toward recovery and wellness. It is psychiatry’s Diagnostic and Statistical Manual of Mental Disorders, and it is the engine that drives a $330 billion psychiatric industry. But is there any proof behind the DSM? Or is it nothing more than an elaborate pseudoscientific sham? 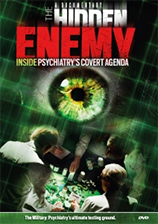 From the makers of the award-winning documentaries Making a Killing, The Marketing of Madness and Dead Wrong, comes the shocking truth behind psychiatry’s deadliest scam. We've got other DVDs, white papers, education kits, booklets, etc. available. The Citizens Commission on Human Rights (CCHR) is a non-profit, public benefit organization dedicated to investigating and exposing psychiatric violations of human rights. Thousands of individuals contact CCHR each year to report psychiatric abuse and criminality, false imprisonment, fraud, sexual abuse and inhumane treatment and conditions in psychiatric institutions. CCHR documents the abuse and helps the individual report the matters to the proper authorities. © 2017 CCHR Seattle. All Rights Reserved. Citizens Commission on Human Rights, CCHR and the CCHR Logo are trademarks and service marks owned by Citizens Commission on Human Rights. Programmed in USA.